I am up in the middle of the night and once again and can’t sleep. Rain is coming down hard and I can hear it on the roof of our house. Our family has been struggling with difficult times. My daughter was in the hospital for almost 3 weeks and I am still recovering from the stress of it and the many nights of no sleep. I feel like I have been down a deep hole and not able to get out. Sad news keeps coming our way, my husband’s uncle passed away, a friend’s boy has cancer, other people suffered losses. Yesterday I found out that a colleague a similar age to me with two kids as well passed away. I cried and cried for her and her family. But then something happened. I turned to my husband and I said I want some joy to come our way. 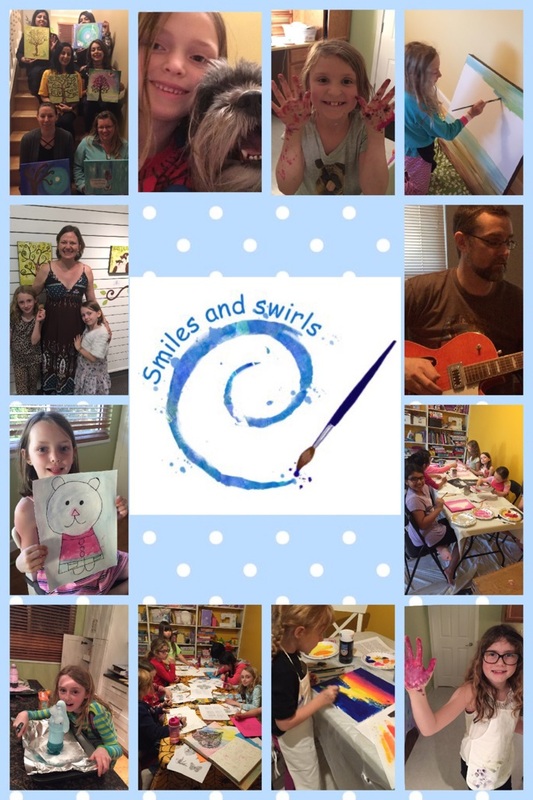 At that moment I looked at my wonderful family….my husband twiddling away on his guitar, my dog looking up at me and wagging her tail, my daughter happily colouring a fashion book and my other daughter humming and baking and I realized I do have lots of joy in my life. I just need to choose it. I mean I need to choose to feel joy again and to have gratitude for all the little things in my life. I need to come up out of the rabbit hole I have been stuck in and have gratitude. I need to stop thinking of all the negative things and start focusing on the positives. The other day I was driving in the car with my 9 year old daughter and she said I can’t believe how great my life is. This is the person who had recently been through one of the most difficult times in her life with painful pokes every day, IVs, being in a hospital, and really not feeling well. I said to her, what makes your life so great? She started listing the little things like driving on the way to her favourite pizza place, a favourite toy, doing a 1000 piece puzzle and I was so amazed at her positive outlook. I started thinking if she can have a positive outlook after all she has been though, I can as well. We live in a world where bad stuff like illness and death happens. When you loose hope go back to gratitude. Our energy moves us. If you keep thinking of what is not working, you will spiral in that. Be open to gratitude and what is available to you. Gratitude opens you up to see other possibilities. I know there are people out there reading this that have depression and I don’t want it to seem that I am saying that just simply choosing joy is the only solution. Please if you do have depression seek out help from a doctor or therapist. 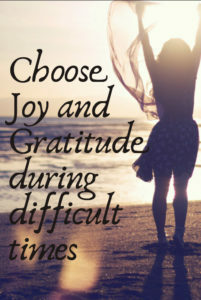 Choosing joy and having gratitude are just one of the tools in the toolbox of getting through difficult times and are for me a first step to feeling better. I am sending out love to you and the things you are going through. I hope what I wrote today helps with something you might be struggling with. I wish I could reach my hand down to you and help lift you up. I am going to start with small steps of writing down the little things I am grateful for and finding some joy. Please share this post with someone and share your stories of gratitude with me. 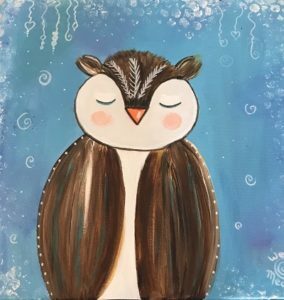 Learn to paint with acrylics and draw an owl using simple shapes in easy online videos. This is a free online class and is a gift for you. Are you ready to create an owl? Click here for more details. 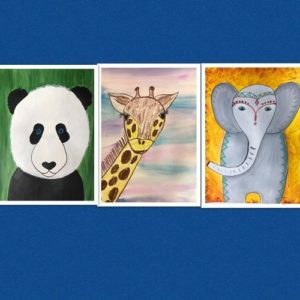 Paint and Create Animals is a 6 lesson online art course for all ages that teaches you how to use different art materials and colour techniques to create paintings of animals around the world. Each lesson includes 2-4 videos of step by step demonstrations as well as sheets of fun facts and instructions. Learn how to draw animals, use acrylic paints, water colour paints and oil pastels to create beautiful paintings. Are you ready to create? Click here for more details.